Raspberry Island Lighthouse had been established in 1862 to serve as a guide for eastbound vessels seeking entry into the channel between the mainland and the Apostle Islands which lead to the harbors of LaPointe and Ashland. However, in practice its light was not visible to mariners until they were fully abreast of Sand Island, from which an underwater ridge with only 3 to seven feet of water stretched south to the mainland. Soon after the establishment of light on Raspberry, mariners began to call for a light on the north shore of Sand Island, to better guide them toward Raspberry Island and the channel, and warn of the dangerous ridge to the south. The Lighthouse Board heeded their call in its 1871 annual report to Congress, requesting an appropriation of $18,000 for the construction of a light on Sand Island. Although Congress elected to ignore the request, convinced of the need for lighting the island, the Board continued to restate its case in each of its annual reports for the following six years. Congress finally responded with the requested appropriation in 1880, and 11th District Engineer Major Godfrey Weitzel set about planning for the station's construction at the opening of the following navigation season. Rather than designing a new structure from scratch, Weitzel chose to use a design that had already been used successfully at McGulpin's Point 1868, Eagle Harbor in 1871 and White River in 1875. While these three stations had all been constructed of brick, with a plentiful supply of Apostle Island Brownstone readily available, the decision was made to use this material in building the Sand Island station. While it would be fanciful to believe that this was a decision based on aesthetic considerations, it is far more likely that the material was selected in order to minimize the costs associated with shipping heavy building materials such a long distance from the Detroit depot. Work began on Sand Island on June 6, 1881 with the arrival of the lighthouse tender AMARANTH to deliver a work crew and materials on the island. After constructing temporary living quarters for the crew, timber cribs 80 feet in length and 8 feet in width were sunk in the lake to create both a landing and protected harbor for the station boat and some 8 acres of thick woods were cleared for the buildings, and to afford a clear arc of visibility for the new light. The rough stone was quarried, and work began on dressing the stone to working dimensions on June 27. With the delivery of the stone to the work site soon thereafter, the work crew turned its attention to the lighthouse itself. After blasting out a hole for the cellar, the masons crafted a two-story dwelling, 26' x 30' in plan with an integrated 44-foot tall tower oriented diagonally into its northwestern corner. The exterior of the first and second stories of the tower were approximately ten feet square with buttressed corners, while the tower's upper portion consisted of a ten-foot octagon. The tower was double-walled, with a circular inner wall approximately four inches thick and eight feet in diameter. This cylindrical inner wall supported a cast iron spiral staircase which wound from two general-purpose areas and an oil storage room in the cellar to a hatch in the lantern floor. Since these spiral stairs also served as the only means of moving between floors in the dwelling, steel doors provided access to landings on both the first and second floors to prevent the spread of any fire in either the dwelling or tower. 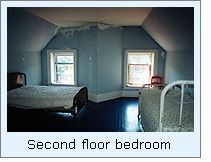 The first floor contained a parlor, kitchen and two bedrooms, and the second floor two additional bedrooms and a closet. Almost as an afterthought, a summer kitchen was built in the form of an addition to the rear of the building. 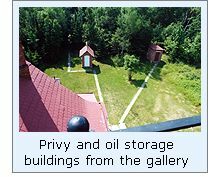 Atop the tower, the gallery floor was sheathed with copper, and surrounded by an iron hand-railing to provide security to keepers when cleaning the plate glass panes in the octagonal lantern. As construction neared completion, Mr. Crump the District Lampist arrived and installed the station's fixed white Fourth Order Fresnel lens, which by virtue of the station's location atop a bluff sat at a focal plane of 52 feet. Charles Lederle was appointed as Acting Keeper of the Sand Island Light Station, and arriving at the station on September 24, 1881 quickly set about moving his belongings into the new dwelling, exhibiting the light for the first time the following day evening, September 25, 1881. The following year, the Lighthouse Board was considering the installation of steam fog whistles at both Sand and Raspberry Island, however consideration of the Sand Island fog signal was dropped, and funds were subsequently only requested for an installation on Raspberry. On August 25 of this same year, Charles Lederle was appointed to the position of permanent Keeper of the Sand Island Light. A work crew arrived on Sand Island in the summer of 1886, and began work on a boat house and improved crib protection, completing the project on September 3. Although Sand Island was located far enough from Bayfield to make trips to town in the station's small sail boat a full day undertaking, life for Lederle was not as isolated as it was for many keepers of island stations. Sand Island was the only island in the Apostles chain besides Madeline, to sustain a year-round population with two distinct settlements. While Shaw Point, the largest of the two communities, was located at the opposite end of the island, Camp Stella was situated a short two miles from the lighthouse, and Lederle was able to interact with the Norwegian farmers and fishermen who called Camp Stella home. Even so, Lederle likely viewed the news that he had been offered a transfer to the new station under construction at Two Harbors as a positive move, since the station was built within walking distance of the bustling harbor town. Emmanuel Luick the 1st Assistant at Outer Island was offered the position of Keeper of the Sand Island Light, arriving on the island with his wife Ella on January 4, 1892. Life at Sand Island appears to have been relatively uneventful for the Luicks through the end of the century until Emmanuel fell seriously ill in 1901. Completely bed-ridden, and without the benefit of an assistant to fill in for him, there was no alternative but for Ella to assume his responsibilities for the three weeks of his illness. From all accounts Ella did a landmark job. However the incident pointed out the potential problems associated with having a single keeper at such a remote station, and Eleventh District Inspector Commander J. C. Wilson authorized the addition of an Assistant Keeper at Sand Island at the opening of the following season of navigation. Henry A Irvine was hired to fill the position, and reported for duty on May 22, 1902. Soon thereafter, a work crew arrived on the island and replaced the stone-filled dock protection cribs, constructed a 16 foot long walkway up the bluff from the dock to the station, and built a 360 gallon capacity oil storage building. Henry Irvine's stay at Sand Island was relatively short, as he was transferred to Devils Island on October 10, 1903. With Irvine's replacement yet to arrive at the station, Emmanuel appointed Ella as his Acting Assistant. However, Ella's official appointment was short-lived as the newly hired Edward Derry reported for duty the following day. Ella would serve again as Acting Assistant for ten days the following year, after Derry resigned without notice on April 30, 1904. Although all external appearances indicated that Ella was ideally suited to life as the wife of a light keeper and that their marriage was built on a strong foundation, there were evidently unseen forces tearing at their relationship. After ten years on the island, Ella boarded the steamer BARKER on May 9, 1905, never to return to either Sand Island or her husband. Later that year, on September 2, 1905, Sand Island's only major shipwreck occurred. Seeking shelter among the islands from the biggest blow in thirty years, the 372- foot bulk steamer SEVONA struck a shoal to the northeast of Sand Island. As the vessel split in two and began breaking-up, the Chief Engineer in the rear section gave the order to lower the life boats and abandon ship. Eleven crew members and passengers were loaded into two life boats, barely making it to shore through the immense waves crashing over the wreckage. Without the benefit of a life boat in the forward section of the vessel, the ship's Captain and six crew members attempted to make it to shore clinging to one of the vessel's hatch cover. However, unable to cling on to their makeshift raft in the huge seas, all seven perished in Superior's perpetually frigid waters. Click here to view an account of the story of the SEVONA wreck as it appeared in contemporary newspapers on the Apostle Islands National Lakeshore website. Luick found a second wife, Oramill, and with her support continued to serve as Keeper of the Sand Island light for the following sixteen years. Whether Luick was a good trainer, or just plain difficult to work with is as yet unknown, however over those sixteen years he went through twelve Assistants, with the longest tenure of any of them being only two years, and seven of them resigning from the service. By the end of the second decade of the twenty-first century, shipping patterns in Superior had changed dramatically, and with fewer vessels heading into Bayfield and Ashland from the west, the importance of the Sand Island Light waned. Concurrent to this change, advances in the use of automated acetylene lighting had allowed the Lighthouse Bureau to successfully automate a number of stations. With such systems being able to operate without human intervention for months at a time the decision was made to install an acetylene system at Sand Island. Effectively eliminating the expense of a resident keeper and assistant, observation and maintenance of the automated light would be added to the list of responsibilities of the keepers at Raspberry Island. A 375 mm lens lantern with a 750-candlepower acetylene illumination system was installed atop a 48 foot steel skeletal tower, and exhibited for the first time on the evening of April 23, 1921. In order to conserve fuel, the characteristic of the light was changed from fixed to flashing, with a repeated cycle consisting of a 1.5 second flash followed by 8.5 seconds of darkness. With the activation of the automated light, Emmanuel Luick accepted a transfer to the Grand Marais, Minnesota light station after a remarkably long twenty-nine years of service at Sand Island. Luick continued to serve at Grand Marais until he retired from lighthouse service in 1937 at 71 years of age, passing away 10 years thereafter. 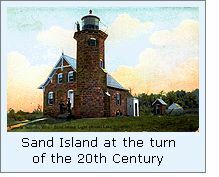 Click here to see a complete listing of all Sand Island Light keepers compiled by Phyllis L. Tag of Great Lakes Lighthouse Research. For five days in July, 2002, we were privileged to serve as NPS volunteers, assisting Park Historian Bob Mackreth in documenting the condition of all the Apostle Islands Lights. We first attempted a landing on the morning of Thursday July 18, but with a relatively strong northeaster pushing three to four footers across the lake, we could neither put in against the rocks in front of the station or at the dock in Sand Bay two miles to the south. However, we did make a close pass by the station, and managed to take the photograph of the waves breaking on the rocks seen at the top of this page. We returned late the following morning, and while the water was not smooth enough to allow us to tie up against the rocks in front of the station, the pilot was able to bring the nose of the boat close to the rocks, allowing us to jump off the bow onto the rocks. This station had never served as quarters for any coast guardsmen, and thus it had managed to escape the standard "white, gray and safety yellow" paint scheme throughout its interior. As a result, we were surprised at the comfortable and homey atmosphere the building exuded. After our pilot brought the boat's bow back toward the rocks, we jumped back aboard, and made a close pass by Sand Island's sea coves as we headed back to the mainland. While all of the Apostle Island Lights are open for visitation during the summer season, a private boat is needed to make landfall at Sand Island for all but two weeks of the year. While Apostle Island Cruise Service offers daily trips around the islands, passing close to Sand Island for photography, it is only during the two weeks of the annual Keeper of The Light festival in September that they offer landings on Sand Island. Photographs taken by the author in July, 2002. Historic and recent photographs courtesy of the Apostle Island Lakeshore.